Just got a very interesting error in my SharePoint 2010. Not exactly sure how it came to be … but anyways. I was making some PowerShell updates to the site … also restored the site using PowerShell … maybe this left the site locked down eventually. First I could not edit or add anything to my SharePoint 2010 site. I tried to log-out and sign-in again. Than I restarted the server – this also didn’t help. Than I tried to change the site collection administrators and I got “Additions to this Web site have been blocked” error. 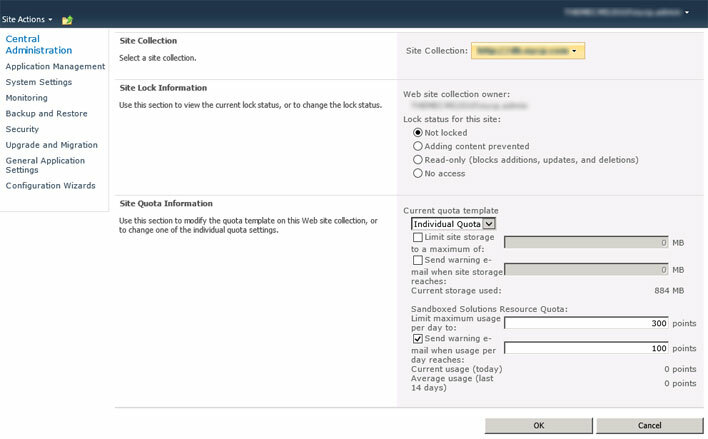 Than I was closer to the solution … had to go actually to Central Administration > Application Management > Site Collections > Configure quotas and locks and change the “Lock status” for the site to Not locked. I just read a tweet question: @robertkuzma do you know syntax for web service call to get “recently changed items” from share point? The important thing here is to properly create the XML you are posting. The article Writing CAML Queries For Retrieving List Items from a SharePoint List might be usefull to construct the SOAP call needed. Don’t forget to add SOAPAction = “http://schemas.microsoft.com/sharepoint/soap/GetListItems” to the header of your POST SOAP call. In my previous posts I was talking about how to use SOAP to SharePoint Webservices using different programing languages (PHP, Android – Java). I found it very convenient to be able to publish also a sample how to do the same in Xcode (Objective-C). I also had to browse the web quite a bit. Finilly I stumbeled upon article from Ravi Dixit about the tipical webservice changing celsius to fahrenheit. Becase I was missing some steps in the code Erhan Demirci steped in. Because I also needed to authenticate this article came handy. I connected the dots, changed the SOAP request and displayed the responce in the screen (also in the log). When creating new project in Xcode just choose View-based Application, name it “SoapSharePoint” and copy-paste the code below. NSString *soapFormat = [NSString stringWithFormat:@"<?xml version=\"1.0\" encoding=\"utf-8\"?>\n"
Also don’t forget to create a label and a button in the XIB (nib) file. Connect the the File’s Owner in outlets output to label and in the received action invokeService to button. Or you can simply download it.